Bobby Ekwere asked "Is there any free software that allows me to see and disable unwanted programs running in the background?" Probably, but I know something better than free software for this job: software that comes with Windows. All current versions of Windows come with a tool to help you trim back what's running at the moment. The look, behavior, and feel of this tool changed drastically (and for the better) with Windows 8. I'll cover Windows 7 and Windows 8 here, but the Windows 7 directions should work reasonably well with XP and Vista. The tool is called Task Manager. 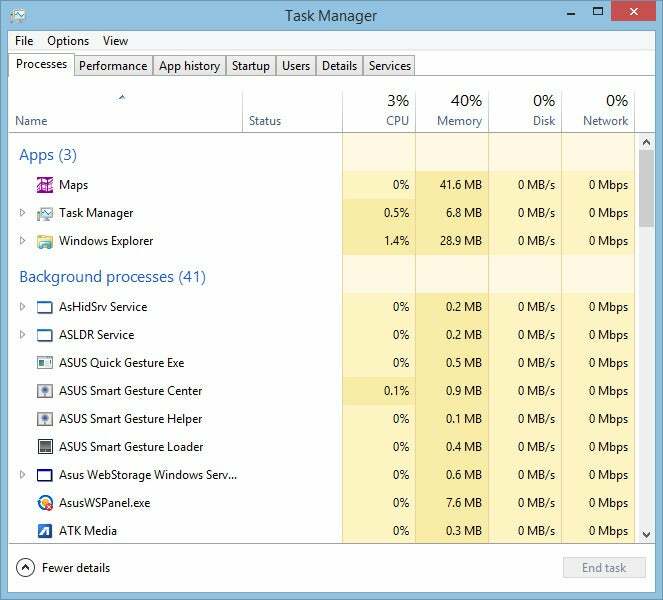 To open it, right-click the taskbar and selecting Task Manager or Start >Task Manager, depending on your version of Windows. In the Windows 7 version, the Applications tab displays currently-running applications. But what's the difference between an application and a program? In this context, an application is a program with its own window--either visible on the desktop or minimized to the taskbar. For instance, your browser, if it's running, is an application and is listed here. Your antivirus program won't show up in this list until you double-click the tiny icon in the notification area and bring up the window. All applications can be closed from within the application--you just click the X in the upper-right corner. But if that doesn't work, you can use the End Task button on Task Manager's Applications tab. But if Windows is overloaded, the problem is probably not applications, but processes--threads of code running in the background. So click the Processes tab. As I write this, the Task Manager tells me that I'm running three applications, but 134 processes--16 just for Chrome. The Processes tab is laid out as a table, and like most Windows tables, you can sort it by clicking the column headings. Click Image Name, and you alphabetize the processes. Click CPU, and you can see which processes are hogging the processor (most aren't). Click Memory, and you'll see which ones are hogging RAM. To stop a process, click the End Process button, and confirm that that's what you really want to do. The Windows 8 version behaves much the same way. The window is better designed and easier to read, and there are a few important differences. First of all, there's no Applications tab. But you'll see both applications and Metro/Modern Interface apps listed at the top of the Processes tab. This layout allows you to see programs and processes together. Windows places icons next to the processes to help you figure out what program launched them. But you might notice that the Processes tab lacks a Description column--a seemingly serious deficiency if you're trying to figure out what a process does. But there's a solution. Right-click the process you're wondering about and select Go to details. This will take you to the Details tab, where the Description column now lives. It will also take you to the same process, so you don't have to look for it again.